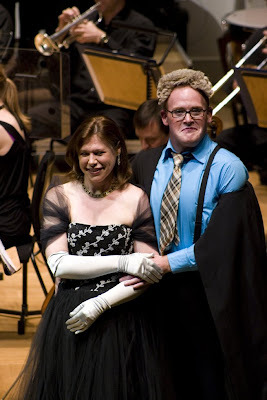 Die Fledermaus - Was it really over a week ago? Producing a concert at this level is never easy and you are never certain how it will all turn out. So many elements to be considered ie Singers, Orchestra, Chorus, Movement, Artwork etc. 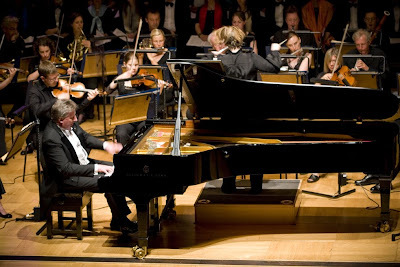 Our recent Die Fledermaus was a major jump for us; not one but two performances plus the addition of a world famous concert pianist for good measure. I am happy to say that Die Fledermaus was one of LLO's greatest successes and provided a fitting end to our first season. 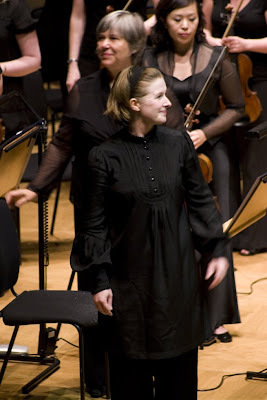 "The real stars of the night though, were not the solo singers but Strauss’s music and the Royal Philharmonic Orchestra, who delivered an excellent performance, under Madeleine Lovell's baton." "and of course Nicky Spence extracted every inch as the muddlesome lawyer." Pictured above are Debra Morley and Ana James. Debra gave a wonderfully rich account of Adele's sister, Ida. I hope that she will work with us again as she truly gave this relatively small role life and was an asset in every scene she was in. Oh and her top notes are stunning and sounded superb in the big finales. 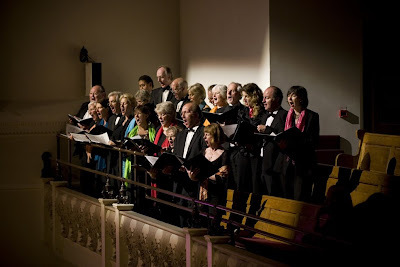 "Ms James delivered possibly the outstanding performance of the evening. 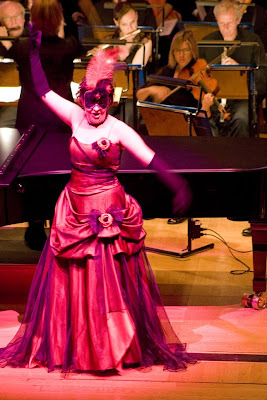 She was a member of the Royal Opera's Jette Parker Young Artist Programme and its influence showed throughout. She gave an accomplished, dramatically expressive performance, playing a sassy, very funny Adele, with some superb singing, especially in her final big moment, during Act III." 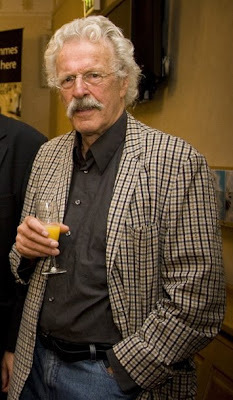 We were terribly lucky to find Bernard Horsfall to play Frosch, the gaoler. Bernard has a rich pedigree acting with the RSC, Dr Who, James Bond etc He agreed to be our dialogue coach, in hindsight this was one of the most important decisions we made. He came to every rehearsal and took detailed notes which he methodically passed on to the cast. His influence was vital to the dramatic integrity we were seeking and ensured that the dialogue reached the same level as the music. "The speaking part of Frosch, the gaoler, was wonderfully played by Bernard Horsfall; his appearance though brief was unforgettable." 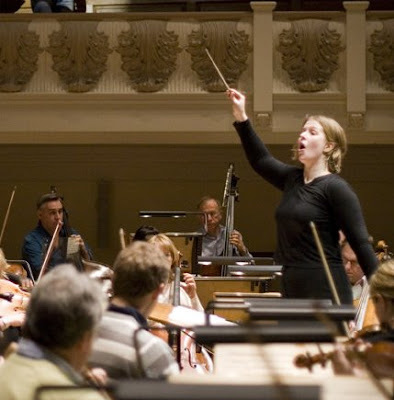 Last but not least I must mention our conductor Madeleine Lovell. This was really her baby. Her fingerprint could be found in every element of the evening. It was a pleasure to develop this project with her. "She is a young, graceful and exciting conductor who led the orchestra and the chorus into an intelligent, expressive and elegant rendition of this popular work. Ms Lovell had an intuitive understanding of Strauss’s witty score and ensured that the music made its full impact on a delighted audience. " 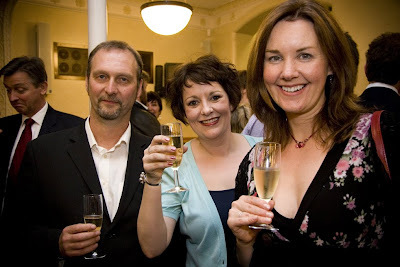 Post Concert Reception - Mick Hurrell, Wardour; Sarah Redgwick; Liz Hughes, HSBC. I wish I had some clever excuse for offering only a small 'snippet' of the Act 1 trio with Eisenstein, Adele and Rosalinda but I am afraid it is nothing more exciting than running out of room on the memory card. This was recorded at the Vernon Ellis concert on Monday 8th June. Once again I admit my bias but Sarah Redgwick is singing the role of Rosalinda beautifully. Sarah, a Guildhall Gold Medal winner, has made her reputation singing Marzelline, Susanna, Zerlina for Scottish Opera, Opera Holland Park, Clonter Opera, Welsh National Opera etc and has recently started singing Violetta for Scottish Opera and Opera de Bauge. Many singers reach a point in their careers where they have to change repertoire as their voices develop and grow. This is such a case. What makes us so happy is the fact that Sarah still performs with the joie de vivre of a Soubrette but with the voice of a Diva. I think this is evident in the clip attached. Charne Rochford has been a revelation to Madeleine and me. His biography is impressive. He sang First Armed Man at Glyndebourne and for English Touring Opera and sang the 1st Priest in Kenneth Branagh's film of the Magic Flute but his strong assumption of the role of Eisenstein with a voice that matches his dramatic resolve is wonderful to see...and hear. Only a small clip here so you will have to come to one of our performances if you wish to hear more of this exciting young tenor. Ana James is, to me, the perfect Adele but I think I have already made my feelings about this exceptional soprano clear in the previous post. Unfortunately you don't get to hear much of her in this clip. :( I really should get a larger memory card. Rehearsals are in full swing and the cast are working hard to make our performances as good as they possibly can. Ana James was cast relatively late. Our original choice had a clash with the Buxton Festival so we reluctantly agreed that we had to find a new Adele. 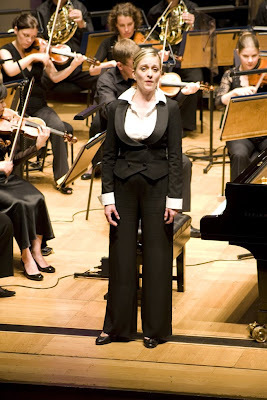 Luckily we were told about this beautiful soprano from New Zealand with the gorgeous voice and magnetic stage presence. A few days later Ana came, sang for Madeleine and was promptly engaged on the spot. We have been incredibly lucky with our cast. Simon Thorpe and Charne Rochford work together as if they were brothers and Lise Christensen plays the bored and world weary character of Prince Orlofsky with aplomb. Jeffrey Black brings real experience to Frank with the bonus of a beautiful baritone voice and has a perfect foil in Bernard Horsfall playing Frosch. Nicky Spence is a younger than usual Blind. He is playing him like a young turk lawyer who unfortunately... isn't very good at his job. Debra Morley who I have worked with on several occasions is luxury casting as Ida. Debra has sung most of the lyric coloratura repertoire with great success. The fact that she is a wonderful colleague is another matter. 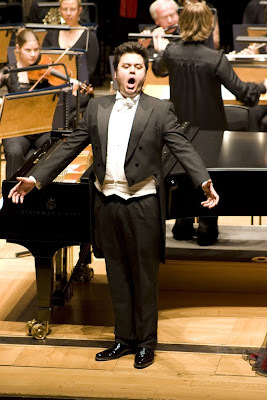 Garrie Davislim has spent most of his career in Vienna, Milan and guesting in Germany singing most of the lead romantic tenor roles of his Fach. A graduate of the National Opera Studio he is a perfect Alfred and a very believable 'lover' of our Rosalinda, Sarah Redgwick. I will stop babbling on and let you enjoy the film. 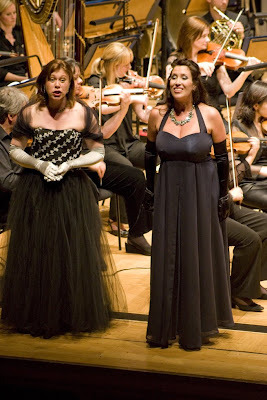 Our performances of Die Fledermaus at Cadogan Hall begin in 10 days. First performance at 7pm on Tuesday 16th June & the second on Friday 19th June. Soloist rehearsals begin tomorrow and the Sitzprobe with the Royal Philharmonic Orchestra and Philharmonia Chorus is on Sunday 14th...we are literally in the home straight. Can't wait to see it all come together. 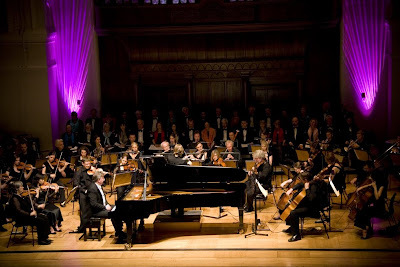 Must admit hearing Leslie Howard playing Liszt's Hungarian Fantasy will be fantastic. His rehearsal with Madeleine went extremely well...it will be quite a concert. Below is the article which our conductor, Madeleine Lovell has written for the programme. For those of you who don't know this operetta this is a very helpful and enjoyable form of introduction. After 135 glorious years as a mainstay of the operatic repertoire, it is all too easy to take Johann Strauss II’s Die Fledermaus a little for granted. The warm familiarity of the score can perhaps endanger our appreciation of Haffner’s and Génee’s well-aimed satire – on marriage, fidelity, mid-life crisis, the aspiring actress, the self aggrandizing tenor, and the sore loser – when, in truth, Strauss’ music provides the perfect foil. It is hard to imagine a musical setting more focused on awkwardness and discomfort. While calling upon all the stock-intrades of comedy – mistaken identity, the battle of the sexes, class-warfare, as well as the requisite happy ending – Strauss never loses sight of the emotional core of the action. Consider, for example, the giddy succession of new themes in the Finale of Act 1 (the trio for Alfred, Rosalinda and Frank), spiralling out of control just as management of the situation spins away from Rosalinda. The middle portion of this Finale (‘Dear Sir, what can you think of me?’ … ‘It’s getting late, we’re tête-à-tête’) reveals what Rosalinda is trying her best to conceal, with a vocal line whose potential urbanity is undermined by sudden leaps, awkward breaks and deliberately fussy grace notes. 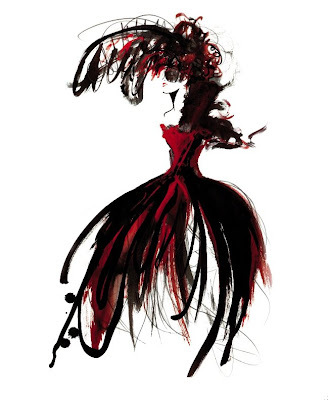 She uses the sophistication of the waltz to paper over her anxiety. The underlying menace of Orlofsky is suggested in a similar way. The vocal register of Chacun à son gout, largely based around the lower-middle part of the voice, suddenly erupts into the highest part of a mezzo’s range. Strauss’ music uncovers the erratic nature of this Prince, and, through remarkable use of the high part of the voice (whose timbre will, inevitably, be very penetrating) in this aria and throughout Act 2, shows us a domineering character. Power play is also at the heart of Rosalinda’s Act 2 show-stopper Csárdás. Supposedly the moment at which Eisenstein’s wife is least sincere, Strauss produces music of unparalleled beauty and emotional strength. Her impersonation of a Hungarian Countess ceases to be an exercise in fabulous fakery (unlike, for instance, Adele’s Audition Aria) and becomes instead a lament for the marriage that she has just seen falling apart. This mesmeric music, with its virtuoso display of the singer’s legato line and dazzling coloratura, makes us appreciate the depths of Rosalinda’s character. This in turn sheds light on why Eisenstein in the end cannot live without her. No account of Strauss’ handling of pace in Die Fledermaus would be complete, however, without mention of the descent into paralytic drunkeness that is the multi-sectional Act 2 Finale. What begins with a champagne toast, quickly dissolves into hiccups and a joyous collective decision to invade one another’s most personal space. The lurching theme of the final section shows us the revellers in the last stages of intoxication. Bacchus would have approved. Please don't forget our Fledermaus launch concert at Vernon Ellis' House 49 Queen's Gate Terrace. Monday 8th June. 7 - 7.30pm. As usual we have pulled out all the stops with appearances by Sarah Redgwick, Rosalinda singing the Czardas; Ana James, Adele will sing the Audition Aria; Simon Thorpe, Falke will sing the famous Bruederlein and Lise Christensen, Orlofsky will sing Orlofsky's famous aria. 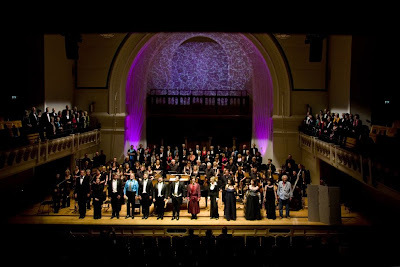 Plus 30 members of the Philharmonia Chorus who will sing the final champagne chorus. A wonderful way to spend a summers evening. Madeleine Lovell will conduct and give a short talk about the piece, with Margaret Marinkovic on the piano. 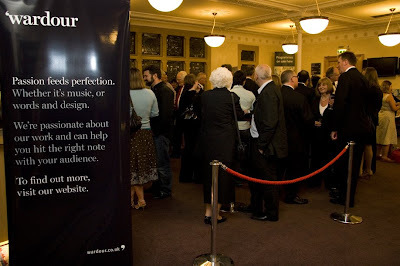 Please email us at info@londonlyricopera.com if you would like any further information. 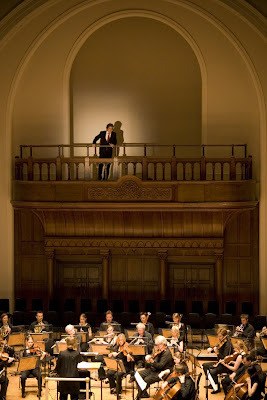 Last night I popped in to watch the penultimate Philharmonia Chorus rehearsal before the Conductor's call next week. It is wonderful to hear the music sung with such joy. This was recorded off the cuff with a very small camera but the results are pretty good. 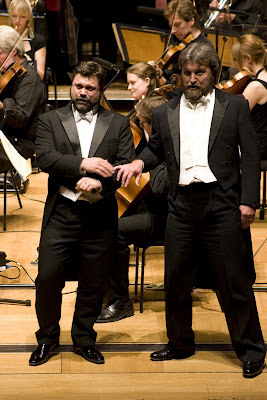 The Chorus Master/ Philharmonia Artistic Director is Edward Caswell ably assisted by Stephen Rose on the piano. event on Monday the 8th at 49 Queen's Gate Terrace as a taster for our friends and sponsors. I hope this will tempt more of you to come to our performances.